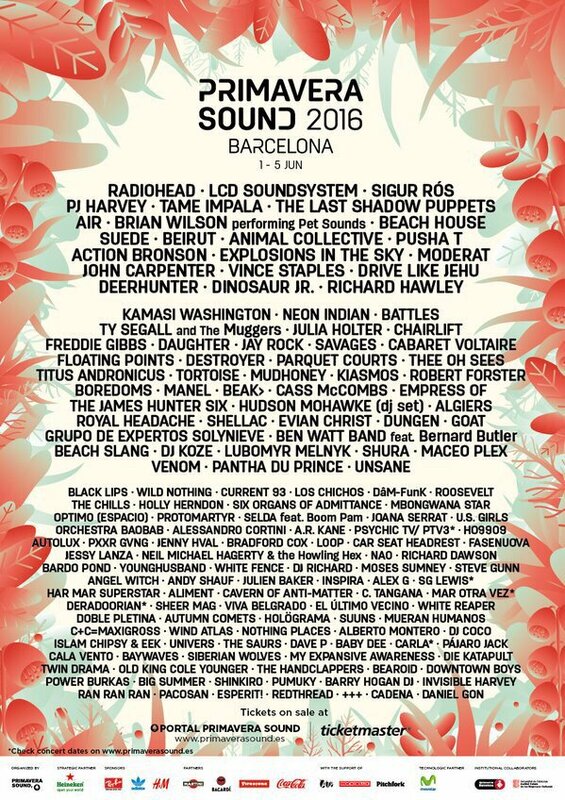 Primavera Sound 2016 (June 1 -5) in Barcelona is going to be EPIC. Primavera Sound is a music festival I have only attended in my dreams. For those of you who are fortunate to attend the 5 day event (of all events) you will have a lot of tough decisions to make. Scheduled are Radiohead, LCD Soundsystem, Sigor Ros, PJ Harvey, Tame Impala, The Last Shadow Puppets, Brian Wilson, Beach House, Suede, Beirut, Animal Collective, Pusha T, Action Bronson, Explosions In The Sky, Moderat, John Carpenter, Vince Staples, Drive Like Jehu, Deerhunter, Dinosaur Jr., Richard Hawley, Thee Oh Sees, Titus Andronicus, MudHoney and MORE MORE MORE.